The wild dog (Lycaon pictus), also referred to as the African painted dog, is considered one of the most endangered wildlife carnivore species in sub-Saharan Africa (Woodroffe & Sillero-Zubiri 2012), and although once widespread, is now extinct in 19 of the 34 countries in which it once existed. The majority of the wild dog population now occurs in the arid zones and in the savannah in southern and south-eastern regions of the African continent. Under ideal conditions, African wild dog populations are able to grow relatively quickly. The capacity of wild dogs for long-range dispersal implies that their populations sometimes reappear unexpectedly and grow rapidly, as shown by natural recoveries in Samburu and Laikipa districts in Kenya (Woodroffe 2011), in the Save Conservancy in Zimbabwe (Pole 2000) and the Serengeti ecosystem (Marsden, Wayne & Mable 2011). Wild dog populations have since 1990 been classified by the International Union for Conservation of Nature (IUCN) as endangered and declining in numbers. A mere 6600 individuals in 39 subpopulations, of which only 1400 were mature individuals, were estimated in 2012 to remain in the wild, with causes of decline given as habitat fragmentation, conflict with human activities and infectious diseases (IUCN 2012). Whereas this decline is generally attributed to habitat loss, other detrimental factors and threats reported include human persecution, accidental capture in wire snares, loss of prey, predation by lions and perhaps competition with larger carnivores such as spotted hyaenas (Darnell et al. 2014). All the causes associated with human encroachment on the African wild dog have not ceased and are unlikely to be reversed across the majority of this species' historical range. Increasingly, spillover of canine pathogens such as rabies virus (RABV) (Kat et al. 1995) and canine distemper virus (CDV) (Alexander et al. 1996) into susceptible wildlife significantly reduces these wild carnivore populations (Berentsen et al. 2013; Cleaveland et al. 2007; Gowtage-Sequeira et al. 2009). RABV also poses a threat to humans (Hampson et al. 2008, 2009; Knobel et al. 2005) and is therefore a disease of paramount importance in Africa, given the extensive circulation and repeated spillovers of infection from the main vector and reservoir species, the domestic dog (Bingham 2005; Lembo et al. 2008). This occurs especially in circumstances where the domestic dog population density is more than 5 and preferably more than 11 per square km, and where they are free-roaming and not vaccinated (Lembo et al. 2008). In many such circumstances, dog rabies outbreaks led to new epidemiological cycles particularly in wildlife species (Lembo et al. 2008). This view of the role of population density has been challenged (Morters et al. 2013), however, and concluded to be more complex, likely differing between species, and complicated by human-dog interactions and movements, especially those in the face of interventions, which may be instigated during rabies outbreaks, such as culling, vaccination and sterilisation (Lembo et al. 2010). Rabies contributed significantly to wild dog mortalities in the 1990s in the Serengeti, in Tanzania (Cleaveland & Dye 1995; Gascoyne et al. 1993), in the Masai Mara in Kenya (Kat et al. 1996), as well as in the Ethiopian wolf (Canis simensis) in the Ethiopian Bale mountains (Sillero-Zubiri, King & Mcdonald 1996). A study over 18 years (1989-2006) in Botswana (Moagabo et al. 2009) of 4306 positive rabies samples showed that over 60% of the 343 wildlife cases were jackal, with 2 from wild dogs. Mitigating such disease threats is challenging, partly because of uncertainty regarding disease dynamics making it difficult to identify the best management approaches. These include identifying reservoir or maintenance hosts (Hampson et al. 2009; Haydon et al. 2002), their population density (Morters et al. 2013) and the susceptibility of various wildlife carnivore species to rabies. Spotted hyaenas, for example, were found to be repeatedly infected with increasing age but not susceptible to the specific rabies strain circulating amongst them in the Serengeti (East et al. 2001). In contrast, a virulent strain reportedly caused mortality especially in aged spotted hyaenas in the Kalahari (Mills 1990). Also, infrequent contact between individual spotted hyaenas in a clan system of low density might tend to delay rabies spread, whereas the frequent especially mouth-to-mouth contacts between wild dog individuals within a pack because of their highly social nature would allow rapid intra-pack spread of rabies (Mills 1993). During a six-week period in 1989 in the Masai Mara of Kenya, 21 members of a wild dog pack numbering 23 died: brains examined histologically from two of these had Negri bodies and another brain tested by fluorescent antibody test (FAT) was positive for rabies (Kat et al. 1995). The potential threat of zoonotic disease transfer is increasing with the expanding global human population, along with increasing global tourism, the decrease in natural habitat areas for wildlife and the increasing human-wildlife interface in and around game parks. There is therefore not only the need to adopt appropriate countermeasures for the protection of endangered wildlife species such as wild dogs but also the associated need to diminish opportunities for zoonotic disease transfer to humans. A study was conducted by Van Heerden et al. (2002) using commercial vaccines intended for use in domestic dogs for rabies, canine distemper and canine parvovirus, in 11-month-old captive wild dogs, with the view to monitoring the safety and efficacy in inducing neutralising antibodies. Administration in four dogs each of either inactivated parenteral or oral live rabies vaccines (given three times) initially resulted in seroconversion in seven of the eight dogs (Van Heerden et al. 2002). These titres, however, dropped drastically within 100 days. It was concluded that the vaccines were safe to use in healthy subadult wild dogs and that a vaccination protocol in free-ranging wild dogs should at least incorporate booster vaccinations against rabies 3-6 months after the first inoculation. An outbreak of rabies occurred in 2000 in a pack of wild dogs in the Madikwe Game Reserve, South Africa (Hofmeyr et al. 2004). This was the second outbreak of rabies in wild dogs following their re-introduction to the Reserve in 1995, the first having been recorded in 1997. The outbreak in question resulted in the death or disappearance of ten out of twelve 8-month-old pups. Because jackals (C. mesomelas) were regarded as the principal host species of rabies in the area, it was assumed that the jackal cycle was the source of the infection. Whereas the pups had not been vaccinated, the five adults, all of which survived, had each been vaccinated by the parenteral route at least twice and all had significant rabies serum-neutralising antibodies. This observation showed that multiple vaccinations against rabies were effective in protecting wild dogs against natural challenge, lending support to findings from other studies in captive wild dogs (Knobel, Liebenberg & Du Toit 2003). On 26 December 2014, a wild dog was found biting at light bulbs in a tourist lodge in Madikwe Game Reserve (Figure 1). It was subsequently shot dead by a park official. This animal was the last of a breakaway pack of six dogs, the rest of which disappeared. The five people who handled the carcass were subsequently each administered VeroRab® (Sanofi Pasteur, Marcy-l'Étoile, France) vaccination as prescribed by the manufacturer. A month later, a second wild dog, the last surviving member of a larger pack of 18 wild dogs, which had also presumably succumbed to rabies, had been showing severely deranged behaviour for 3-4 days at the same tourist lodge in Madikwe. It had chased staff and guests around the lodge, torn sofas to shreds, chewed on furniture and roamed inside the lodge buildings, fortunately without direct human contact, until it was shot at the nearby waterhole on 26 January 2015. Subsequent to this, a carcass of a spotted hyaena found dead at a waterhole near the tourist lodge on 27 February 2015 was submitted for testing. Half of the brain from the carcasses of the first male wild dog (Agricultural Research Council - Onderstepoort Veterinary Institute [ARC-OVI] reference number# 889/14, i.e. sample number 889 of 2014), the second wild dog (ARC-OVI reference number# 66/15) and the spotted hyaena (ARC-OVI reference number# 113/15) were submitted on ice to the OIE Rabies Reference Laboratory at the ARC-OVI to exclude lyssavirus infection. Immunohistochemistry (IHC) was carried out at the Section of Pathology, Department of Paraclinical Sciences at the Faculty of Veterinary Science, University of Pretoria, Onderstepoort on formalinised, wax-embedded brain tissues from the first wild dog and the hyaena. On receipt of the specimens at ARC-OVI, composite brain smears were prepared and subjected to the direct fluorescent antibody test (dFAT) as described previously (Dean, Abelseth & Ataanasiu 1996), and counterstained with Evans Blue (at 0.00125% concentration). In brief, the smears were acetone-fixed and stained with a polyclonal anti-lyssavirus fluorescein isothiocyanate-labelled conjugate (ARC-OVI, Pretoria) and then viewed under ultraviolet fluorescence. The carcass of the second wild dog showed advanced autolysis; however, brain specimens for dFAT were taken and performed as for the first. Rabies immunohistochemical labelling using the immunoperoxidase (IMP) test was performed in parallel on brain tissues of two of the Madikwe animals (the first wild dog and hyaena). Sections of cerebellum, cerebrum, hippocampus, midbrain and salivary glands were labelled and evaluated using a polyclonal antibody (prepared by the late Dr Ken Charlton: Agriculture Canada: Animal Diseases Research Institute: Nepean Polyclonal Rabbit Anti-Rabies Antibody) at 1:500 dilution using a standard published method (Haines & Chelack 1991) and was adapted by Pashwane and Clift of the Veterinary Faculty's Pathology IHC Laboratory (2010). Subsequent to the positive dFAT and IMP tests, the lyssaviruses were then typed with a panel of 16 anti-nucleoprotein monoclonal antibodies (provided by the Canadian Food Inspection Agency, Canada), as described previously (Ngoepe et al. 2014). 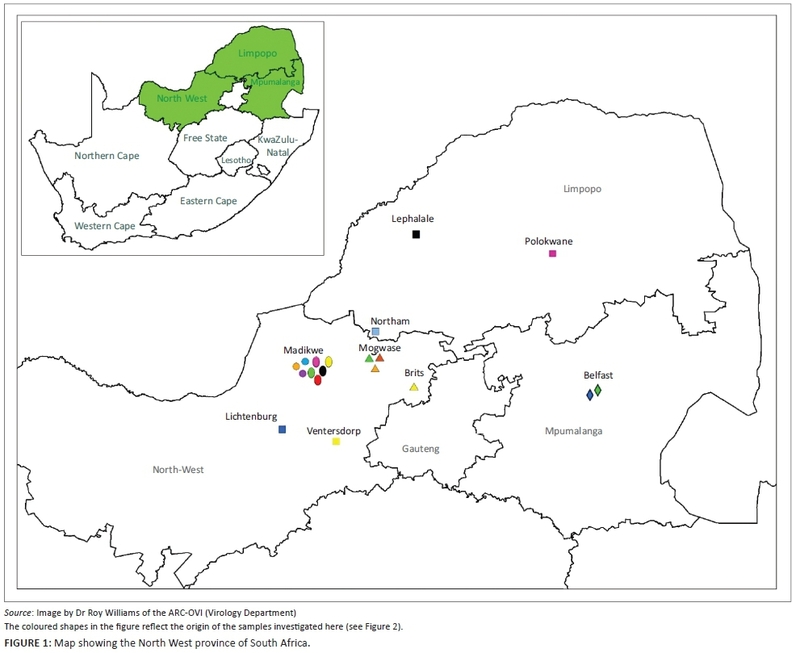 The lyssaviruses confirmed in the 1997 wild dog rabies outbreak together with the most recent viruses from wild dogs and a hyaena from the Madikwe Game Reserve and adjacent localities were genetically characterised by amplifying and sequencing a partial region of the highly conserved nucleoprotein (N) gene. In brief, Trizol-extracted viral ribonucleic acid (RNA) from original RABV-infected brain tissues (approximately 200 ng of tissue) and freeze-dried infected mouse brain material (for wild dog viruses recovered prior to 2000, see Figure 2) were reverse-transcribed and amplified using the Lys001 (+) (5'-GATTCCTCTCTGCTTCTAG-3')1-15 and 550B (-) (5'-CAAAGGAGAGTTGAGATTGTAGTC-3')647-666 primers (the numbers in subscript indicate annealing positions of the forward and reverse primers in comparison to the Pasteur Virus genome) (Markotter 2007; Sacramento, Bourhy & Tordo 1991). The polymerase chain reaction (PCR) amplicons of approximately 600-bp size were purified using a Qiaquick® PCR purification kit (Qiagen, Germany), sequenced bidirectionally on an ABI3700 (Inqaba Biotech, Pretoria) and consensus nucleotide sequences of both the forward and reverse sequences were generated using algorithms in MEGA 4 (Tamura et al. 2007). A neighbour-joining tree was reconstructed using the nucleotide sequences generated from this study and others from GenBank, which were recovered from domestic and wildlife carnivore species from South Africa (Figure 2). The significance of the branching pattern was statistically evaluated with 1000 bootstrap replicates. Lyssavirus antigen was confirmed in the brain tissues of the two adult wild dogs and the hyaena using dFAT and for the first wild dog and hyaena using IHC. Typical apple-green fluorescence virus-infected particles were observed in 100% of the field of the composite brain smear and in addition, antigen was observed immunohistochemically in glandular epithelium of the mandibular salivary gland of the first wild dog (889/14) (see Figure 3b). 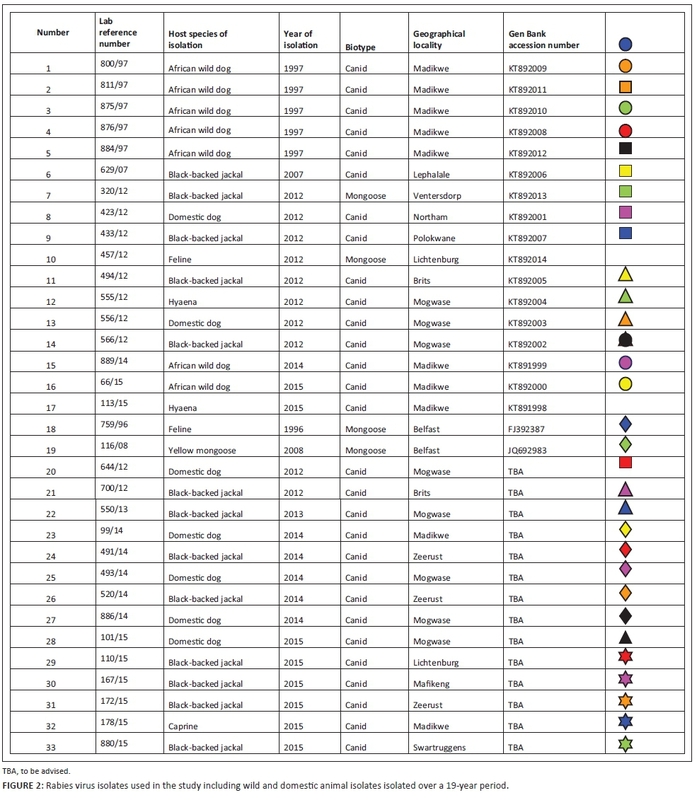 The sections of the brain tissues evaluated showed strong RABV-specific positive immunohistochemical labelling. Numerous, variably sized intracytoplasmic inclusions (Negri bodies and rabies dust) were observed in nerve cell bodies, axons and dendrites in all sections of the brain of both the first wild dog (889/14; Figure 3a) and the spotted hyaena (113/15). The antigenic reactivity patterns of the wild dog and hyaena RABVs were similar and consistent with those observed for other southern African canid RABVs (Ngoepe et al. 2014), commonly maintained in domestic dogs (Canis familiaris lupus) and wild carnivore species, such as black-backed jackal (C. mesomelas), bat-eared fox (Otocyon megalotis) and side-striped jackal (C. adustus). Rabies trends in the North West province of South Africa over a 10-year period (2005-2015) showed that significant numbers of cases, for example, 44.4% (2007), 58.8% (2012) and 18.3% (2014) of the total annual confirmed animal cases, were positive wildlife cases as recorded at the OIE Rabies Reference Laboratory at the Onderstepoort Veterinary Institute. Whereas the RABVs from wildlife species such as jackals and hyaena in 2007 were of the mongoose rabies biotype, those in 2012 and 2014 were of the canid rabies biotype (Onderstepoort Veterinary Institute records), highlighting the biological variations within the classical RABV variants found in southern Africa and the occurrence of spillover events between wildlife and domestic host species (Nel et al. 2005). 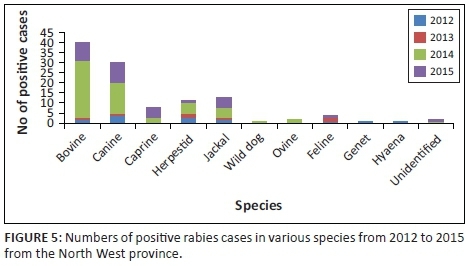 A more detailed analysis of the positive rabies cases by species for the period 2012-2015 (Figure 5, as performed by author CS) showed rabies incidence in domestic canines, jackals and bovines of 28.6%, 14.3% and 12.0% of the total positive rabies cases, respectively. A decrease in positive rabies cases in domestic canines and jackal species was observed in 2013. However, in the subsequent year (2014), there was a dramatic increase in positive cases in canines (to 25.0%), bovines (to 46.7%) and jackals (to 8.3%) and similarly in 2015, with increases in canines (to 31.3%) and jackals (to 15.6%), but with an observed decrease in bovine cases (to 28.1%). Utilising primary diagnostic tests such as the dFAT and IHC, we were able to confirm lyssavirus infection in two wild dogs and a hyaena from Madikwe. The lyssaviruses identified in the current 2014-2015 outbreak inside the park were canid rabies biotype, which delineated into clade 1b of two sub-clusters, 1a and 1b, both consisting of a mixture of domestic (dog) and wildlife (jackal) viruses (Figure 1). This strongly suggested a link between wildlife and domestic dog rabies cycles in this part of South Africa, and such an association is not unique to this region. The clade 1b canid-type rabies isolated was closely related with that diagnosed in dogs, jackals and hyaena outside Madikwe in 2012. Viruses in both clades 1 and 2 could be clearly distinguished from viruses in group 3, representing the mongoose rabies biotype, a variant believed to have been introduced into this region at least 200 years ago (Van Zyl, Markotter & Nel 2010). According to Haydon et al. (2002), the target populations of concern in the current outbreak would have been wild dogs and the hyaena, although non-target susceptible species were also considered as potential reservoirs. The question then arose as to the likely sources or reservoirs of infection in the 2014-2015 Madikwe outbreak. The diagnostic and molecular data obtained were insufficient to unequivocally implicate any species, but domestic dogs and cats, jackal, wild dog, hyaena or even bat-eared foxes from inside the park or the same species except wild dogs from outside the park, could potentially have been sources. In South Africa, 'predator proof' fencing around small reserves has been very effective at keeping wild dogs confined inside the reserves, provided the fence is properly maintained, but such fencing has also been reported not to be 100% effective (Davies-Mostert, Mills & Macdonald 2009). The fence surrounding the Madikwe Game Reserve is meant to be continuously electrified, although interruptions do occasionally occur. The fence has an apron packed with rocks to prevent animals excavating below and is composed of large-size mesh (Bonnox [Pty] Ltd, Fencing Manufacturers, Centurion, Pretoria, South Africa), through which only small mammals might pass. Aardvark (Orycteropus afer) occasionally dig holes under the fence at Madikwe, although these holes are usually closed by park staff within 24 h of initiation. A factor of likely significance in the period prior to the 2014 wild dog rabies outbreak in Madikwe was the effect on the wild dog behaviour of the chemical contraception applied by the park in 2014 as a result of their rapidly expanding population. Wild dogs numbered 34-36 in February 2014 and 26 in September 2014, at which time contraception was introduced. Their numbers thereafter dropped to 13 when counted on 16 February 2015 because of the subsequent rabies outbreak (field data of RH-W). The reproductive intervention had resulted in fragmentation of the northern and southern packs and creation of smaller groups, which appeared to increase antagonistic encounters between these splinter groups. These aggressive contact encounters would likely have exacerbated intra-specific, wild dog rabies transmission. Mills (1990, 1993) outlined how the highly social intra-pack behaviour of wild dogs using mutual mouth licking as well as aggressive biting contact would allow rapid rabies transmission in this species. Spread of rabies amongst members of a spotted hyaena clan as well as inter-clan spread depends on the number of clans, clan size, their density in an area and on the ranks of the affected animals, which would affect behaviour and potential contacts with other hyaenas. In general, widely distributed clans or clans with few members would show slow intra-clan and inter-clan spread. Spotted hyaenas rarely meet with all clan members and individuals tend to be solitary or in small groups. They are more territorial than wild dogs: they scent-mark and defend their territories from other clans (Mills 1993). An unusual rabies outbreak was recorded in southern Kalahari in a small spotted hyaena clan in 1990 where all four clan members died (Mills 1990, 1993), whereas in another southern Kalahari outbreak affecting several clans, none of the packs were decimated. Jackals often interact with hyaena around carcasses and bite contacts may occur between the two species (Mills 1993). Reliable park data on accurate hyaena numbers during the years prior to and during the 2014-2015 Madikwe rabies outbreak were, unfortunately, not available. Molecular techniques have been shown to be useful in confirming RABV infection even in decomposed and exhumed carcasses, as recently demonstrated by two independent groups (Markotter et al. 2015; McElhinney et al. 2014). In the former study, severely decomposed brain material was tested for the presence of RABV genomic material using a quantitative real-time reverse transcription-PCR (q-real-time RT-PCR) assay when conventional molecular methods were unsuccessful. In the latter study, carcasses received for rabies diagnosis were occasionally decomposed because of delays in them being found, in submitting or storing them and in such cases a rabies-specific hemi-nested RT-PCR could detect viral RNA on day 70 of the storage of the carcass, suggesting the persistence of infectious RABV in carcasses. The detection of RABV RNA from a carcass decomposing at 35 °C for 48 days supports the use of molecular assays to accompany OIE-prescribed rabies diagnostic tests particularly when decomposed samples are submitted (McElhinney et al. 2014). Therefore, it is important that field personnel be aware of the applicability of the dFAT and molecular-based tests such as PCR in diagnosing lyssavirus infection in decomposed specimens. It should also be remembered that carcasses which have been buried and later exhumed for specimen taking as for rabies may be surprisingly reasonably preserved as a result of the low and constant ambient underground temperature. The value of IHC for rabies diagnosis in formalin-fixed samples was clearly demonstrated in the current study. If fresh tissues cannot be submitted for whatever reason, as commonly happens in remote areas of South Africa and other parts of the continent, or where other preservatives such as glycerol saline may be in short supply, IHC can be considered as an equivalent alternative method for rabies diagnosis in animal tissues where diagnostic facilities offer such tests. Furthermore, with IHC, the virus inhabiting cells and any associated pathological changes in the brain are clearly observable, in comparison with other diagnostic methods such as the dFAT or molecular techniques. Formalin fixation of the brain preserves tissue architecture and allows histological evaluation to formulate a differential diagnosis (Stein et al. 2010). With IHC, antigen was observed in the salivary gland of the one wild dog, thereby illustrating the advanced clinical stage of infection in this animal. Thus, IHC provides a diagnostic alternative to dFAT and can be used with confidence - specificity and sensitivity of rabies IHC is currently being formally investigated (to be published, author DJvR); however, our experience shows it to be as sensitive as the dFAT. Immunohistochemistry is of use particularly in tropical and remote areas where cold storage and rapid transport of fresh tissues may be impossible, and where exposure to fresh sample tissue may place human or animal contacts under zoonotic risk. Personnel and laboratory employees should treat all fresh samples from suspect rabies cases as potentially rabies-infected and when appropriate throughout the dFAT procedure, as RABV is not inactivated with acetone fixation (Jarvis, Franke & Davis 2016). Exposure of fresh and infective tissue to 2% buffered formaldehyde for 60 min inactivated vaccinia virus, human adenovirus and murine norovirus into non-infectious but structurally intact forms allowing for morphological diagnosis by electron microscopy (Möller et al. 2015), with effectivity increasing at higher temperatures of 25 °C - 37 °C. Another study reported that 3% formalin (1% formaldehyde) was ineffective in inactivation of 99% of 10 000 mouse intracerebral lethal dose, 50% (LD50) of RABV within 1.0-2.5 min (Kaplan, Wiktor & Koprowski 1966). It is generally accepted that 10% neutral buffered formalin preserves tissues and inactivates most pathogens including viruses but excluding prions, at room temperature and when left for at least 24 h - 48 h; however, specific reference to this was not found. The optimal ratio of the tissue:formalin is 1:10, and bulky firm tissues should be incised at regular 1-cm or narrower intervals to allow penetration of the formalin. C.T.S. initiated the study and was in control of the initial diagnosis, molecular testing and interpretation of PCR results at the World Organisation for Animal Health (OIE) rabies reference laboratory; he wrote up most of the introduction, molecular biology methods and results; compiled the table and map; and wrote much of the discussion. D.D.J.v.R. contributed the histopathology of the second wild dog and the hyaena case, wrote the section on immunohistochemistry with its discussion and contributed the histopathology images and legends. B.P. amplified some of the viruses after accepting the fresh tissue samples submitted to the Onderstepoort Veterinary Institute OIE rabies reference laboratory and sequenced and generated phylogenetic trees. B.P. also contributed to the writing of the manuscript. D.M. antigenically typed the viruses involved and generated trends analyses of rabies in the North West. R.F.H-W. contributed all the field data pertaining to the numbers and environmental observations in Madikwe Game Reserve during the time prior to and during and after the rabies outbreak and interpreted those findings - he supplied information on the running of the park and maintenance of the fence; the movement of radio-collared jackals mentioned is data from his individual project. C.E. was Field Ecologist in Madikwe at the time and provided the information on the situation around the behaviour and shooting of the two wild dogs as well as pack numbers and movements just prior to the losses. She also provided field information on the hyaena that was found dead. She also provided precise information on vaccination and control measures taken against rabies and other infectious diseases in the pets belonging to Park staff. J.H.W. took the specimens from and wrote the histopathology of the first wild dog case and did further research for both introduction and discussion, specifically with respect to possible epidemiology and reservoir hosts, especially jackal; she also recruited both C.E. and later R.F.H-W. to contribute to the background field data and its interpretation, and helped in refining and co-ordinating the final preparation of the manuscript to reach its current form.